Costa moved to Chelsea for Atletico Madrid this summer and has adjusted to life in the Premier League in style, scoring four goals in just three games. 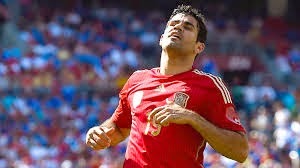 At international level though Costa has struggled and is yet to register a strike in five caps for Spain, since switching allegiances from Brazil. Costa started and struggled for Spain in their 1-0 loss to France last night, with the reigning European Champions failing to register a shot on target. “I really want to score with Spain,” he is quoted as saying by Marca. “Our game is to have the ball a lot, have a lot of possession. “I am aware that I have to adapt to them. Spain start their European Championship qualification campaign against Macedonia on Monday and the Chelsea man is expected to lead the line once again. In Spain’s qualifying group, they will also face the likes of Ukraine, Slovakia, Belarus and Luxembourg.